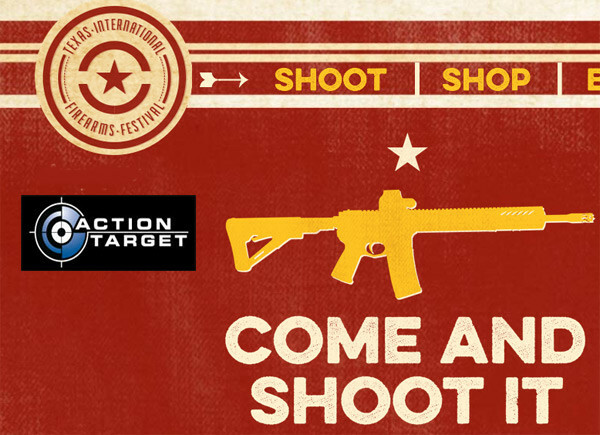 Provo, Utah –-(Ammoland.com)- Action Target has been named the official target partner of the Texas International Firearms Festival for its inaugural event taking place near Austin, Texas, Nov. 8-9. The event, which is expected to draw up to 5,000 people per day, will feature more than a dozen firearms manufacturers and the opportunity to try out various guns on Action Target’s steel targets. With 30+ dedicated firearms demonstration try and buy shooting bays and a tented retail village with ammunition and accessories, the two-day festival is one of the biggest of its kind in the world. Action Target will have a dedicated sales tent at the festival where attendees can purchase a wide variety of steel targets including the targets featured on each shooting bay. Tickets to the festival are available at www.TexasGunFest.com on a first-come-first-serve basis with 5,000 tickets available for each day. The festival will take place at the Best of the West Shooting Range in Liberty Hill, Texas, from 10 a.m. to 5 p.m. each day. Action Target Inc. is a privately owned business headquartered in Provo, Utah. As a world leader in shooting range technology with more than 4,000 products and 40 patents for the systems it designs and manufactures, Action Target has installed thousands of shooting ranges across the United States and in 25 other countries around the world. Action Target also designs systems and conducts firearms training for law enforcement and various military divisions. For more information on Action Target, visit www.ActionTarget.com. To learn more about Action Target products or to purchase items online, visit www.ActionTarget.com/store.